Throughout our time in Africa, a friend of mine had kept messaging asking if we had got engaged yet. She was joking around but we did have several conversations over whether we would get married one day and how I would not like to be proposed to in a cheesy/ touristy place in front of other people. Andy was in agreement, but it was clear from his responses that he most definitely didn’t have a plan in place. Despite this, however, I couldn’t help but get a little panicked on each occasion that we did a ‘momentous thing’ or found ourselves in a stunning setting. 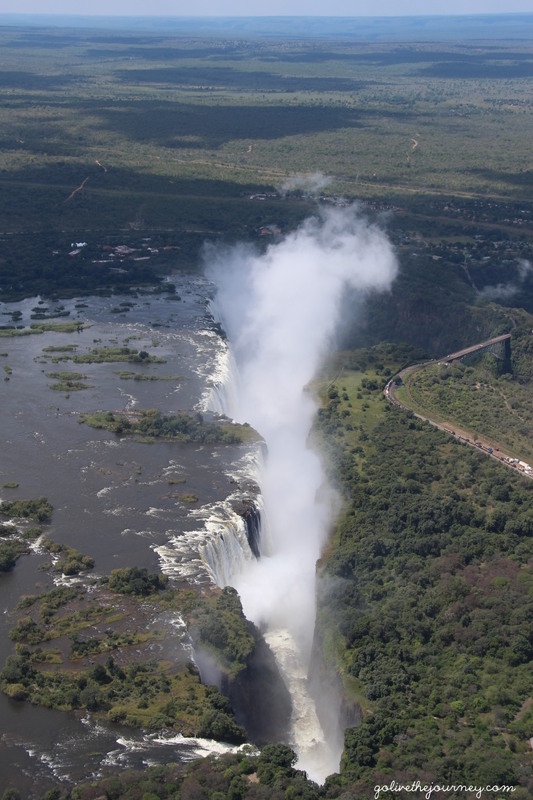 Needless to say, on the day that we headed off to Zimbabwe to see Victoria Falls I felt this anxiety once again. We had decided to take a day trip after a tip off from the campsite owner as to the charge for taking a car over the border and fees we would have to pay to customs officials for the missing tyre flaps and number plate. It worked out cheaper to do a day trip and luckily we did as the day before we experienced our very first flat tyre. I’m not talking a little flatty but almost a whole blowout. Thankfully there was a garage on the road to Kasane, but sadly they did not have the correct tyre size in stock. Even they couldn’t help us remove the spare from the under carriage and we didn’t want to rely on the one and only accessible spare to make it all the way back to Windhoek. They put this on in the meantime and we contacted the car hire company. They said that they would refund us provided we sourced the exact same tyre as what was on the vehicle already. It was turning into a bit of a nightmare. After what seemed like hours in the baking sun they found someone that had the tyre but they were miles away and it wouldn’t be able to get there until 4pm the following day and they would be closing at 5pm. This left us with a very tight window to get back from Zimbabwe and have the tyre put on the car so that we could set off in the small hours to get back to Maun the next morning. We took the risk. The next morning we set off towards Zimbabwe. It is only a short drive to the border but getting through customs took longer than I anticipated. There were strict measures in place and the officials most definitely did not give us the warmest welcome to the country. 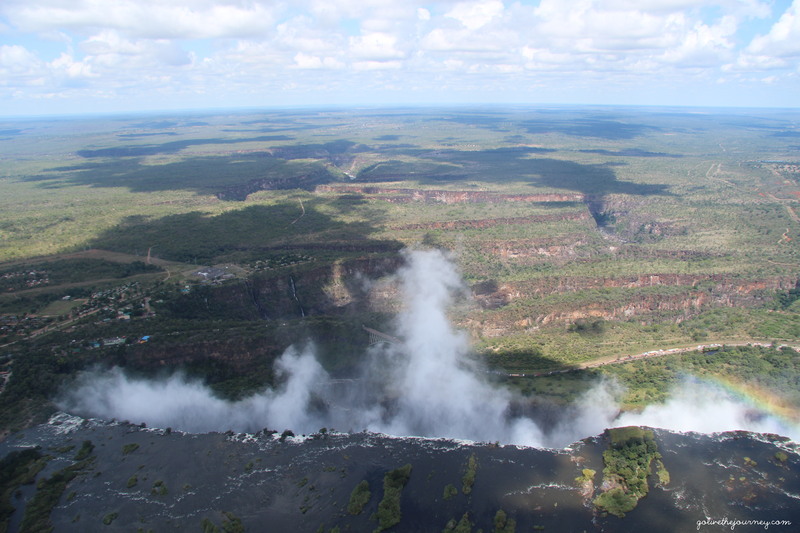 We made it through though and after a few hours’ drive arrived at the town of Victoria Falls. It was obvious that this place had sprung up purely to cater for tourists visiting the falls and I hated the touristy vibe associated with this. There was a walk through the trees that you could do, providing some spectacular views of the waterfalls but we managed to get around this in about half an hour or so. Andy was behaving oddly and the engagement anxiety began to creep back. I am not going to lie, I had put some make up on that morning just in case, but we had discussed how a natural wonder like the falls was a bit of a cliché engagement spot for us. Luckily we made it around with no knee dropping. We headed for some lunch, ready to meet our driver who was going to take us to the heliport for our helicopter ride over the falls. After a few bites he came running over explaining that he had managed to squeeze us onto an earlier spot which would mean we would definitely make it back to deal with the car that afternoon. The only problem was that we would have to leave now and then go straight back after the heli-ride as there was another couple heading back earlier too. Having seen what we wanted to by foot we were more than happy with that decision. 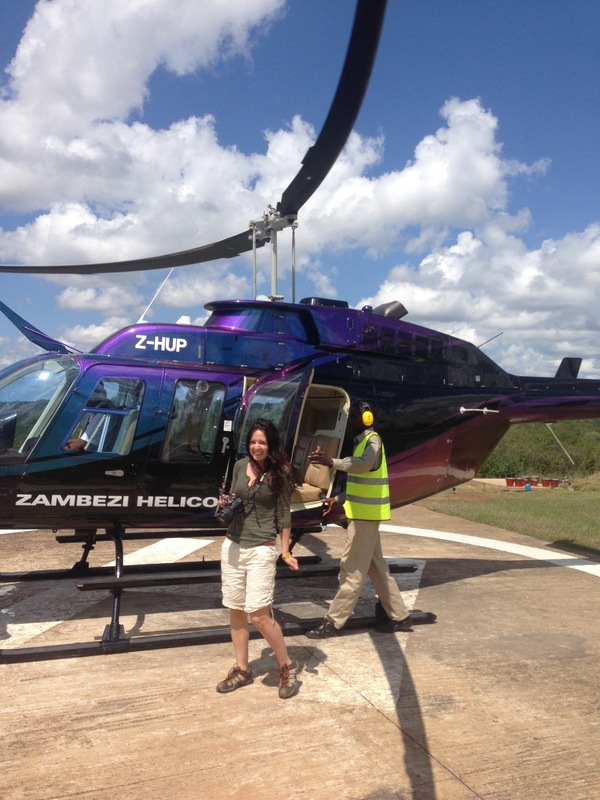 I had never been on a helicopter before and was pretty scared embarking on this new adventure. There was a Russian couple on the flight with us. They looked good, all glam and smelling nice. We didn’t really – we looked like we had just stepped off the set of an Indiana Jones film, but it didn’t matter as it was all about the Falls showing off her beauty. Seeing it from the sky was spectacular, it was only from here that you could really experience its grandeur and the way that the earth just fell away causing the tonnes of water to just drop over the edge. We made it back to earth and headed back to Kasane. 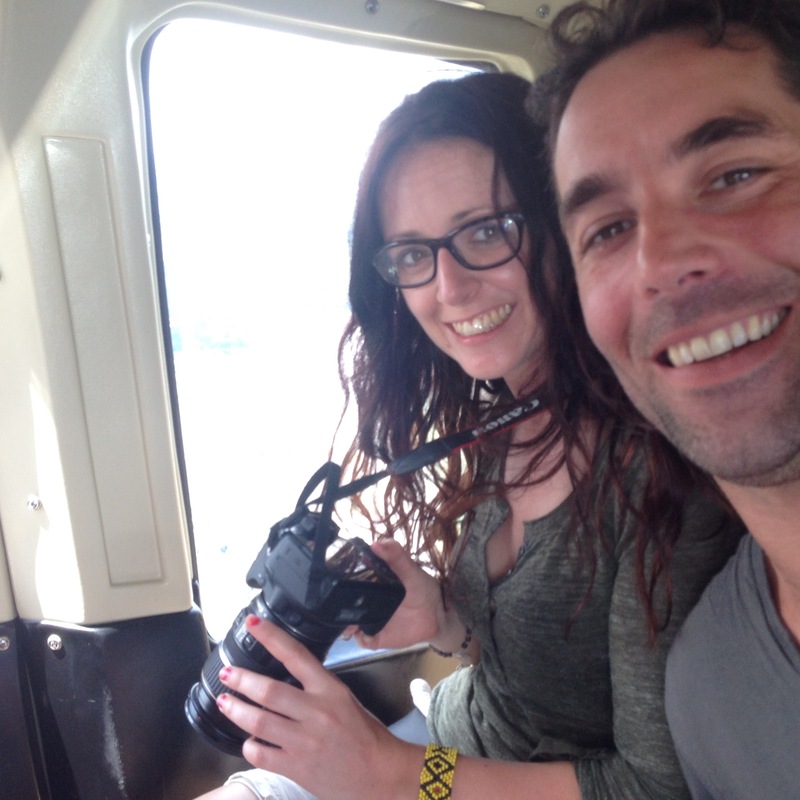 At this point I began to really relax, grateful for the fact that Andy did not pop the question in the helicopter. It was the end of all the natural wonders on our trip and while part of me perhaps was disappointed that this holiday hadn’t turned into the one that we got engaged on, I also felt relieved that Andy had not succumb to the pressure and done something in a way that wasn’t what we wanted. That evening, after a shower and a scrummy braai, I donned my usual attire of hippy style pyjama pants, hoody and newly advised boots and socks to avoid the ever prevalent black mumbas that we were told lurked around the campsite. Black mumbas are one of the world’s deadliest snakes; if you get bitten by a juvenile snake you are more likely to get a higher dosage of venom as they don’t have as much control on their venom release as adults. Standing as high as 2 metres tall, these snakes can be extremely angry creatures and I most definitely did not want one sneakily going for my exposed little toes. Suddenly, Andy fell off his chair. Well this was my interpretation of the kind of half-arsed squat position he had speedily taken up: “Will you marry me?” he spluttered, as our privacy was shattered by the arrival of two other campers. Finally, we both relaxed a little. It turned out he had been planning this for some point on the trip the whole time but just hadn’t found the right moment had come along until that night when we were sat there happy relaxed and soaking up the nature. No wonder he had been acting so strangely all day, knowing that time was running out. He had already planned a morning wildlife viewing with coffee as a back-up plan. We chatted about how awkward we had just found that whole experience and how we didn’t want to have a big wedding with all the trimmings and then we celebrated with another drink, messaged some family and friends and went back to the tent for our last night in the wilderness.